Phineas for Cheryl are completed! And with plenty of time to spare. They finished drying yesterday and her birthday is today. Deadlines? I scoff at deadlines! Scoff scoff, scoff scoff scoff! Knit top down with a flap heel. I wouldn't really recommend doing this because I was very lucky that the last whole "diamond" at the foot was completed just where the toe decreases should start. Otherwise, I may have ended up with half a diamond. 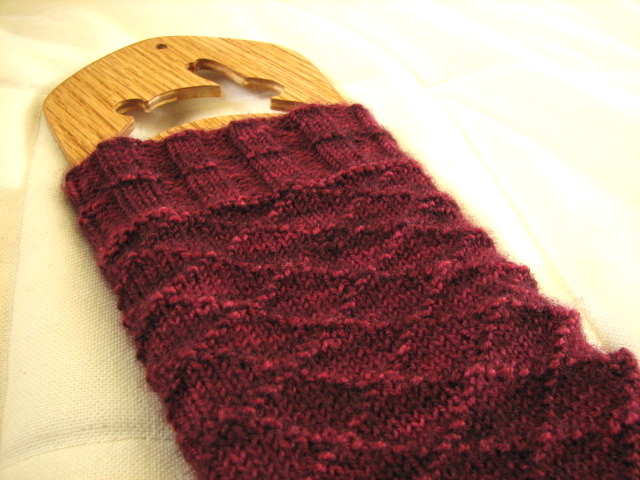 If you knit toe up as the pattern is written, then you can just keep knitting the cuff until a diamond is done. 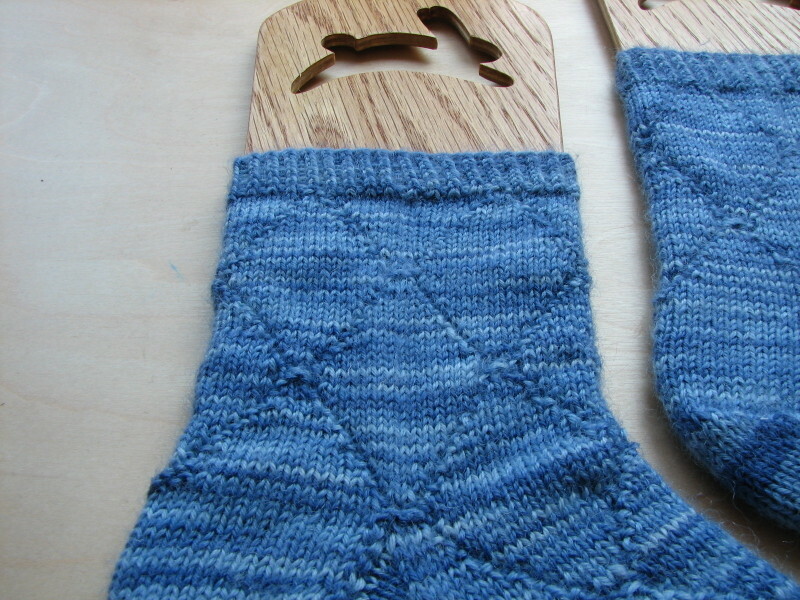 But I wanted to knit them on circulars and I couldn't be bothered figuring out how to cast on for a toe on that. 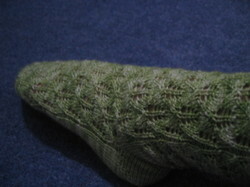 Gentleman's sock in Lozenge Pattern! 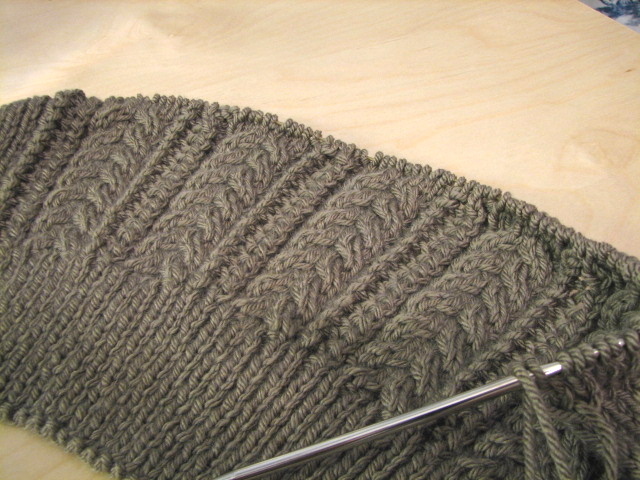 Great pattern, great yarn. 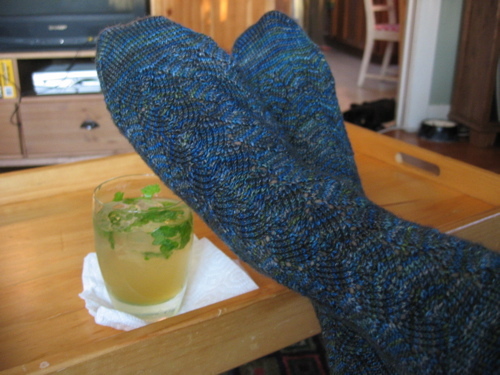 I will definitely be knitting more socks from this book. 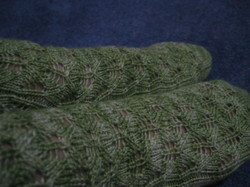 The yarn was scrumptious to knit with and is lovely knitted up, but wow the yardage is a nailbiter! I usually never ever worry about running out of yarn, but with this pair I was seriously wishing my electric scale could plug into UK outlets. 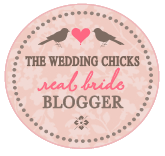 Gosh I have really fallen apart with this knitting blog thing. 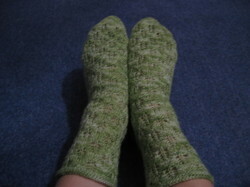 Anyway, here are some socks I started when I moved to England and I finished them oh, about two weeks ago. Yarn: If you think I can remember the yarn after 5 months since starting this thing, you have a very high opinion of me and I thank you. Nice lace pattern. I created a chart myself in Excel because the pattern is written out and I prefer a chart, but by the time I got to the leg I didn't need it anymore. 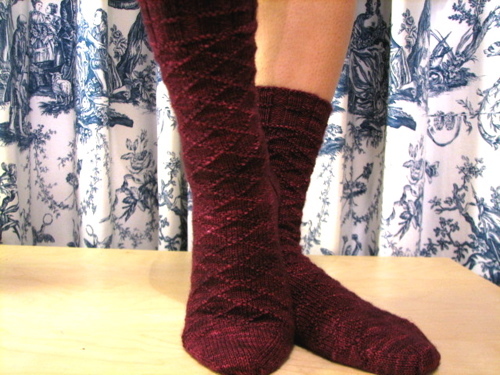 And during the course of sock completion, there was a lot of time between picking up the project and I found I didn't need to refer to the chart at all to figure out the lace pattern on my own. It has a good snug fit and the garter stitch cuff is surprisingly effective for its simplicity, it doesn't roll as I feared it would despite it's small size and the "wavy" edging created by the lace pattern. 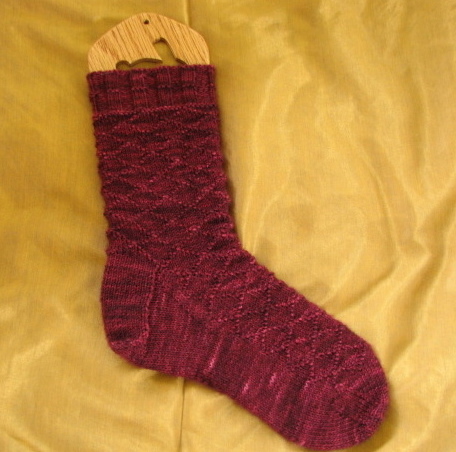 I messed up on my heel because after the turn I got carried away with knitting the sole side and forgot to pick up the pattern on the leg, but that's my bad of course. I'm currently working on this zip up cardigan in white (same yarn as featured on that page). I think I am deficient in using stretchy yarn. I love working on the zippy Addis but tension is quite elusive. My stitch gauge is spot on but not the row gauge so when I finished the back and so although the width will fit snug it's about 3 inches longer than it should be! Oh well, I plod on hoping my front pieces stretch as much. I don't mind it being longer as I'm not too keen on showing that strip of bare tummy like the model in the picture. Ok, don't like fall over from shock but I have FOs to show off. I'll give you all a minute to rub your eyes and make sure you read that right. Falling Leaves from Knitty. To be honest, it's been a while since I finished them and finally got around to taking a pic so I don't really remember how I felt about the actual project. But I do lurve the end result. And that's not just the mojito talkin'! 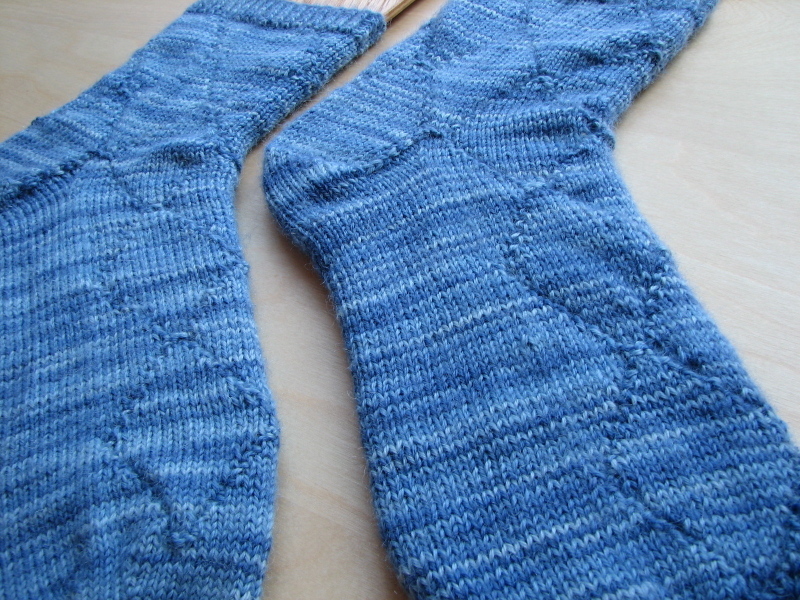 This is the first pair of socks I've made using Blue Moon's Sock Club yarn. 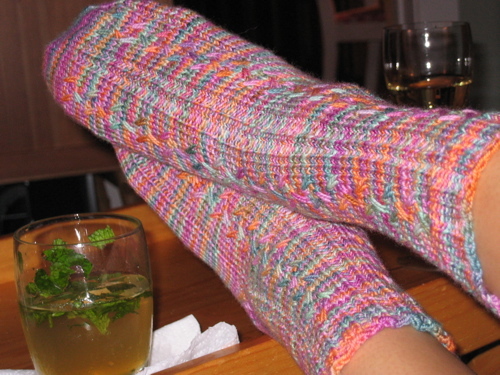 I'm not ashamed to admit that this is NOT the pattern that came with the sock. I think one of the cool things about the club is not only to see the variations of people's socks but also results of the same sock in a different pattern. The pattern was created by Kris, so go bug her if you want it. And yes, that is the mojito talkin'. Trekking was great to work with. I used my Crystal Palace 1's for the first time and at first I was not that impressed. 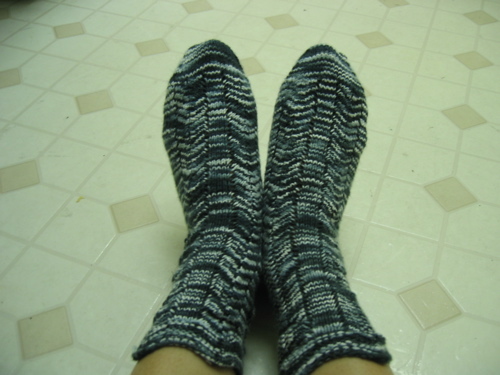 But two socks later, I really like them! Very smooth and slippy. I thought I was done, tried it on and that neckline...!! I'm not auditioning for Flashdance anytime soon so I gotta figure something out. The rest of it (the modified sleeves, the waist, the length) is great! It must be something about the yarn because I followed the pattern exactly. 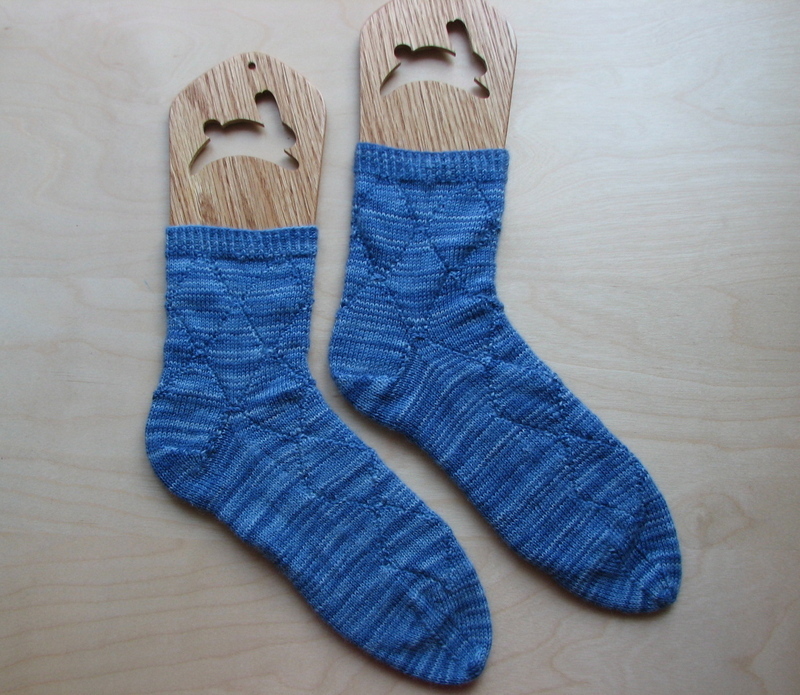 I'll have to brainstorm with Kris and Marisa at our next knit night on Monday to rescue this project.